Services - Innovation Loft | UNLEASH YOUR TEAM’S POTENTIAL! At Innovation Loft we are massively committed to the success of every event! Most clients look to us to deliver fully conceived and facilitated workshops and the services below show the typical activities that are involved in planning, executing and following up on a truly transformational event. However, we are flexible. If your event has different needs or you wish to "bring your own" agenda, facilitation or resources to help run the event, then we are happy to provide whichever services you need. We consult on the purpose and objectives of your event to achieve maximum clarity of the definition of success. Having the right people in the room and the right sized group has been shown to be critical to workshop success. We'll work with you to review your invitee list and ask key questions to help you consider if the participant group has been optimized. We can help with both primary and secondary research to ensure that the participants in your event have key information at their disposal to achieve your goals during the session. For example: competitive research, trends research, best practices, etc. We can draft communication and potential pre-reads to your participants to set the right expectations to get them primed for the event. To the degree that your event includes presentations, we will work with you and your presenters to clarify the objective of each presentation, its appropriate duration and the best way to incorporate it into the event design. We can also coach presenters to maximize their effectiveness. Most workshops move between knowledge rich presentations and interactive smaller-group exercises, games and activities designed by our innovation experts. Our goal is to unlock your team's potential and put them in a state that encourages creativity, focus, collaboration and decision making. The Innovation Loft in Chelsea is an extremely stimulating and creative environment that can be highly customized for each event. Often we strive to create a "knowledge rich" environment filled with visual information about the topic of the workshop, which might include images, charts/graphs, or other relevant information. We can use our 50+ three-feet tall digital signs to fill the environment with information and change it at different points during the day. Sometimes we bring in props, sample artifacts, technology demonstrations or design other relevant physical spaces. Alternatively, if your event is not at Innovation Loft, we can help create a stimulating and effective environment in other locations. If you have out-of-towners, we can coordinate with nearby hotels where we receive discounts that we pass on to you. If you have a large number of people coming from a single location we can arrange for buses or vans. 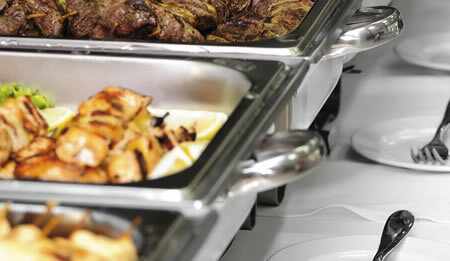 We provide water, coffee/tea and soft drinks and can bring in any one of our outstanding catering partners, or you can "bring your own catering." 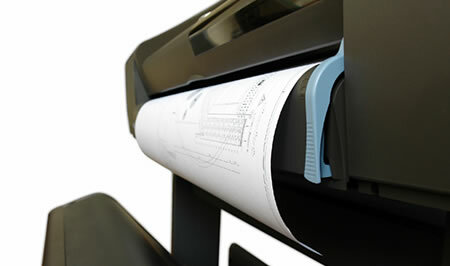 With onsite black-and-white and color printing, as well as a plotter, we can create handouts, signage, or other materials as needed. Name Tags are very important for easy social interaction, so we print branded name tags for every event. A memento of a key event is not only a fun "thank you" for the team's hard work but can also serve as a powerful reminder of the commitments made at the event. Our facilitators will drive the workshop forward with custom-designed activities that will unlock your team's potential through brainstorming, games, exercises and other innovative strategies. They also help manage time, uncertainty and conflicts. 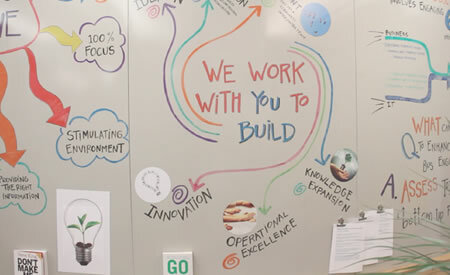 We will take photographs and make copies of all the hard work your team puts into the workshop, so go ahead an draw on the whiteboard and get creative with markers. We'll make sure nothing is lost or wasted. 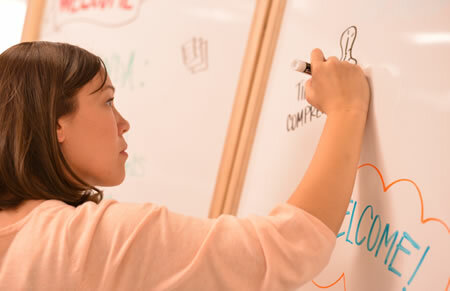 Specially trained artists will draw diagrams and images during group discussions to create a unique and creative record of the discussion. Music is a powerful tool to set the mood, so we provide a music master who selects and plays music throughout the day. We can support projection, digital signage, and microphones as needed. Transformational workshops are "magic moments" in your organization's history. Recording them serves as an anchor for future purposes. During most events, as the event progresses, we put images of key moments around the room to serve as a concrete reminder of what has occurred and amplify the momentum of the event. Our environment allows for flexibility during the workshop and our facility support team is always setting up for the "next" activity while the current activity is taking place so your event flows seamlessly. We can take the myriad of drawings, ideas, lists, decisions and plans and translate them into business graphics, Microsoft Project files, or your preferred format for you team to leverage in the future. We can produce a document illustrated with photos and drawings from the event that tells the story, the purpose, and the outcome. Typically there is a need for ongoing collaboration by all or some of the workshop participants to make the vision or plan created in the workshop a reality. We provide a wiki platform on a SAAS (Software as a Service) basis that is a great way to keep the collaboration momentum going forward. Alternatively, we can work with your corporate collaboration platform, such as SharePoint, to achieve similar results. It can be effective to have quarterly or periodic check-ins with those implementing the workshop outcome to evaluate progress and adjust strategy as needed. Each team is different and every situation is unique, but we know that we can offer your team inspiration and solutions through our services, environment and facilitation expertise. Whether you need a little bit of help to get things moving or a turnkey workshop, we will help lay the stepping stones towards your goal in a positive, innovative and efficient way.